WOW! you really know your stuff and I commend you on your efforts as well. You are really doing well jim!? I aslo have a ton of respect for Lynn in so many ways, not to mention her accomlishments in running and riding. I remember learning about doug and his amazing abilities. As I say all the time, "I have a lot to learn"? thanks!!!? I am hopeful that if I keep hammering now as i age, I can keep the momentum, I think it's much easier to keep the level of intensity up than to chase the ice cream truck later!? ? Plus I really love doing this- although I will say I really enjoy it much more out there. That is the key.? Easy to do something you enjoy.? Sometimes I push myself a bit, sometimes I admire the roses (or stop at the local baseball field and watch the Little League games), but I always enjoy getting out and about.? And Ron, I agree with Mike. It's easy for you to compare yourself with the 3% that's more fit than you, but you are certainly in the 95th percentile I imagine. And, by the way, I couldn't do that Mt. Werner ride that you did. And don't tell her this, but I have a ton of respect for Lynn as well.? Amazingly supportive and encouraging for such a Type A personality.? ? And yes, its harder to play catch-up as you get older.? 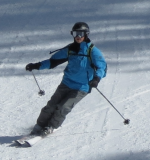 Wish I had learned to ski much younger. wow, group hug a pepsi (or is it coke) and some beers please! 3% no way!!! the ride is not as difficult as you are thinking, take the mental image out of it. its not like I went 2100 straight up without a few stops in there. There are plenty who can. BTW- Here are the result of the Steamboat town challenge thunderhead climb race. I think our time was 1:10.
my friend Ira should have raced in this, he's 56 and in incredible shape. he's a machine. He had to wait for me! They take different route that's a little easier but still a grinder. Climbing on a ride that lasted more than an hour when you live at sea level.? My hat REMAINS off.? Well done.? ? 3% of USA's 300,000,000 population is still 9,000,000 people that are in better shape than you? ? Hows that for a different perspective??? Ira may well be in the 99th percentile or better. From Lynn's friend Glynn who runs the bike rides we've done. "Remain humble.? If someone passes you going up a hill, remember that there are probably a 100 things that you can do better than they do.? If you pass someone going up a hill, remain humble; there are probably 101 things that they can do better than you." yeah, I like that quote, I am the only one responsible for me.... it's 100% up to me to do better or worse. I admire those who have made the commitment to improve their performance whether it's at our level or the elite athlete. I love it when you are challenged to do more than you think you can do and overcome it. Even if it's a runner going for a 10 minute mile when the runner is giving it 100%. I love it when you are challenged to do more than you think you can do and overcome it. I absolutely agree. The feeling of satisfaction when I completed the Farm Ride last year was amazing. The longest training ride Lynn and I had done was 40-45 miles, and to be able to complete what wound up being 78 miles was immensely gratifying. I knew Lynn could do it, I wasn't so sure about me as a second year rider. Probably the same for you and some of the terrain that you were dropping into last year at your Chile camp, a little bit surprised by your own accomplishments. hey 78 miles is awesome! Great job!! yeah chile was great to push the limits and still come out smiling. I definitely had a few runs where at the top I was feeling it in my stomach for sure.